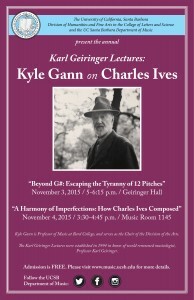 Next week I’ll be in Santa Barbara giving the Karl Geiringer Lectures, named for a famous musicologist who taught there, one (public) on microtonality, and the other (for musicologists) about what we can learn about Ives’s compositional process from his sketches. The latter is mostly about the First Piano Sonata, since we have many more preliminary sketches for that than for the Concord, and there’s really only one page I’m discussing at length: the presumptive first sketch written at Pine Mountain, CT, and dated Aug. 4, 1901. But it’s a fascinating page, an abbreviated and prescient outline for what would become a much longer movement. I’m also relating that at some length to Ives’s discussion of composing in the Essays Before a Sonata, which I think has never been taken seriously enough as a philosophy of what makes music great. When I get back I’ll publish the Ives lecture somewhere on the internet – here, if no more prestigious locale presents itself. 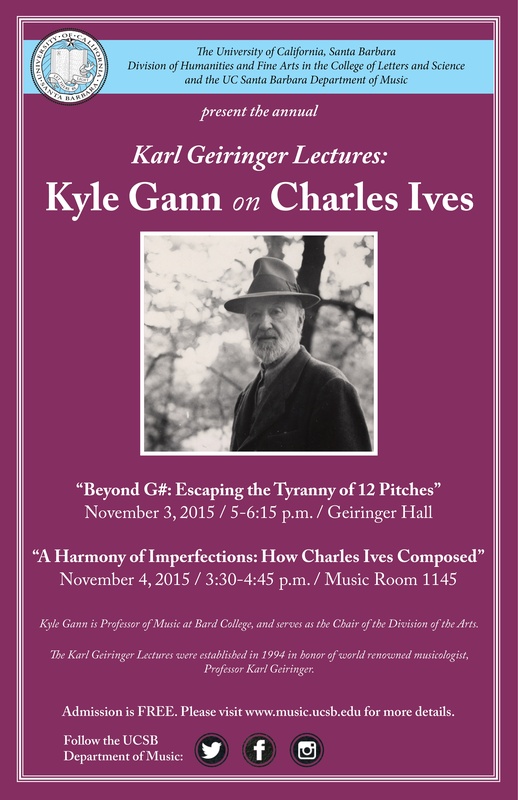 I guess the UCSB people decided having a photo of Ives on the poster would bring in more people (or repel fewer) than a photo of me. If you’re in the area, that’s November 3 at 5 in Geiringer Hall for the microtonality lecture, and November 4 at 3:30 in Music Room 1145 for the Ives lecture. I’ve already given the Kushell Lectures at Bucknell, the Poynter Fellowship Lecture at Yale, and the Longyear Musicology Lecture at the University of Kentucky. I just Googled “named musicology lectures” to see if there was a list I should be crossing off somewhere, but nothing came up. Hit ‘n’ miss, I guess. Peter Thoegersen and I are planning to go to the Tuesday lecture on microtones. Looking forward to it! KG replies: Excellent point, wish I’d asked you first.